19 “Sir,” the woman said, “you must be a prophet. worship the Father on this mountain or in Je­ru­sa­lem. is looking for those who will worship him that way. the village to see him. 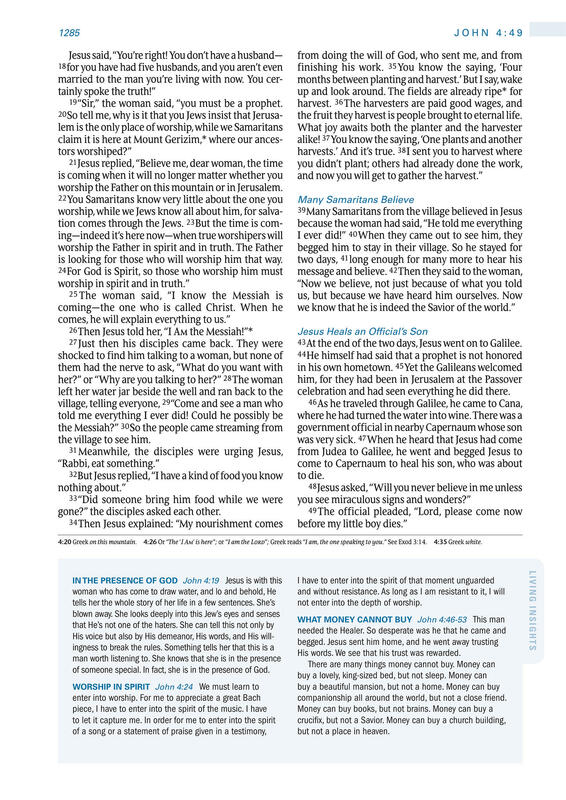 gone?” the disciples asked each other. the fruit they harvest is people brought to eternal life. 43 At the end of the two days, ­Jesus went on to Gal­il­ ee. celebration and had seen every­thing he did there. 4:20 Greek on this mountain. 4:26 Or “The ‘I Am’ is here”; or “I am the Lord”; Greek reads “I am, the one speaking to you.” See Exod 3:14. 4:35 Greek white. of someone special. In fact, she is in the presence of God. not enter into the depth of worship. His words. We see that his trust was rewarded. companionship all around the world, but not a close friend. but not a place in heaven.